Here's a rough sketch of the next prototype. This one will have two periscopes, each one tilted up at an angle so that your point of view is also raised upward by a few feet. I'm hoping that this will help to pull you out of yourself a little bit. I'll experiment with the angles later. It looks pretty unwieldy as it stands, so it's clearly going to need some kind of support structure. Haven't decided exactly how to go about that yet, but I have a few ideas. Once I actually sat down with the materials, I realized a lot of this design would have to change. First of all, the cone of view you get from a 10-inch mirror at a distance of 4 feet is too narrow to be of any use. And the triangular design started to seem way too ambitious, since I still had no idea of how to hold the thing up. So I went with a straight horizontal beam shape instead. Final sketches for the second prototype. The metal brackets I had been using turned out to be too flimsy to keep the large mirrors stable. And the plexiglass of the mirrors was itself very flexible, so they wiggled around a lot. To stabilize them, I used chunks of two-by-four mounted perpendicular to the main beam. Clamping the mirrors onto those in two places locked them down really well-- but then the action of the clamps actually warped the mirrors, completely distorting the view. Removing one of the clamps seemed to make it a bit better. I also raised the small mirrors up off the beam, so that they'd be center-aligned with the big ones. This made everything else much easier, since now all the mirrors could be perpendicular to the beam, eliminating one of the variables. I used a miter box to draw lines at a 45-degree angle to align the supports to, but to be safe, I attached them with just one screw so that I could go in and adjust the angle by eyeballing it later. The vertical angle I adjusted by sticking a shim under one of the small mirrors. As a temporary support, I screwed in a little tripod socket on the underside of the main beam. My tripod wasn't strong enough to keep the big mass from swaying back and forth, but it was at least steady enough to look through and play with. I took it to the park to test it. As you can see, my eyes are now over three feet apart. The results are pretty good, but could be better. 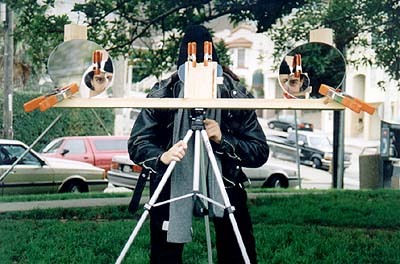 The interocular distance is now about 3.5 feet, or about 15 times normal, or triple the effect of the first prototype. Using two periscopes instead of one makes the whole experience much easier on the eyes, I think because you're not dealing with as many differences between one eye and the other. And the circular viewport really adds something to the experience. Problems: there is some rippling from imperfections in the mirrors (more than before, due to the greater distances) although it hasn't seemed to bother people so far. Also, the plexiglass mirrors scratch very easily. I'll have to try glass ones next. It turns real 3-D into fake 3-D.
Hey, it's Mr. Rogers' Neighborhood! It's like looking at the real world through a Viewmaster. On the downside, some people still found adjusting to the 'scope difficult, like looking through someone else's glasses. Some of this is probably due to warping in the mirrors. However, it's also possible that there may be some muscle strain due to the fact that your eyes are converging on one plane and focusing on another. I wonder whether there's a lens-based design that would get around this problem too... clearly I need to learn more about optics! I also left the device alone for a while, to see how well it would function without an explainer standing over it. Some people had trouble figuring out where to put their eyes, and what to look at. Adding eyepieces should fix this problem. The context is very important for people's perception of a device like this. 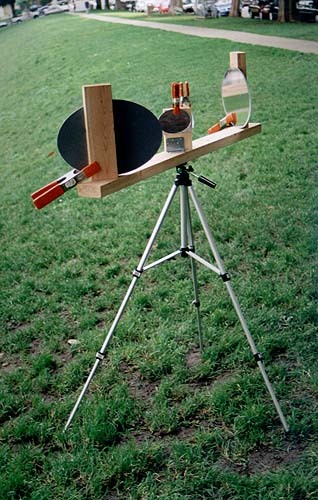 In a city or suburb, people will most likely assume that it's some kind of surveying device, or whatever its purpose, that it's not for them to touch or play with. (Out on the playa, hopefully people will assume the opposite!) The choice of materials may make a difference here: if it looks sturdy and idiot-proof, maybe more people will be willing to interact with it.